A&E's official app lets you watch your A&E favorites anytime of the day. You can access more content by logging in to your cable TV subscription. Check out the shows. You can browse through and look for your favorite shows or see the newest episodes at a glance with featured shows displayed nicely across the top. Once you select a show, you can pick a season or a specific episode. The handy Watchlist lets you add shows you want to delve into at a later time. A&E has some great original content, but it can be hard to find time throughout the day to watch the channel live on TV. 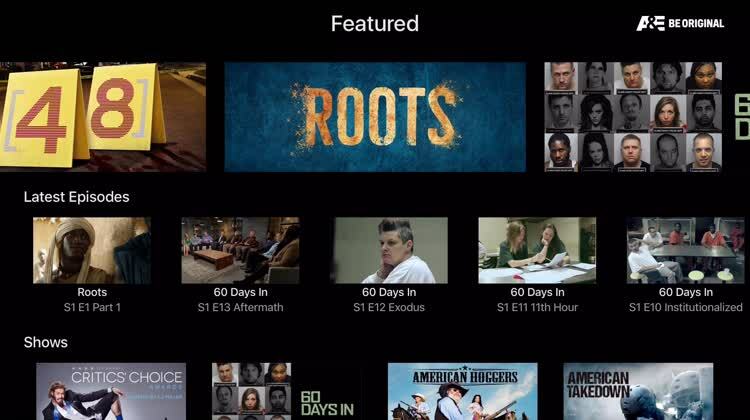 Fortunately, the A&E Apple TV app lets you access all of A&E's original programming whenever you feel like it, and the app is completely free to use, no cable TV subscription required. However, if you do have cable, then you can log in with your provider's information and get access to extra bonus content. Either way, it's a win-win with A&E's Apple TV app. We have found some of A&E's content to be entertaining, and this official Apple TV app makes it super easy to catch up on our favorites anytime. Watch full episodes of Live PD, The First 48, Wahlburgers, Intervention, Ozzy & Jack’s World Detour, and more and access exclusive video extras wherever and whenever you want. The A&E app gives access to full episodes and clips from all that A&E has. New content is added all the time.